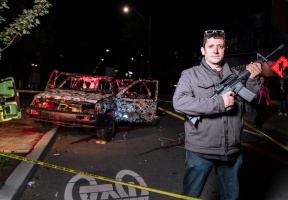 Renowned artist Viktor Mitic is bringing a rolling art installation titled Shot Up Car to Chicago on November 15th to November 17th, 2018. 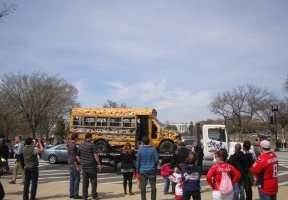 The art piece is a gun-riddled vehicle that has been fired at more than 6000 times to provide a compelling image of the ramifications of gun violence. Mitic has partnered with Parents for Peace and Justice in Chicago, a non-profit organization that is on the front lines on the fight against violence in Chicago. During the rolling exhibit, Shot Up Car will be stopping at key locations throughout the Windy City. 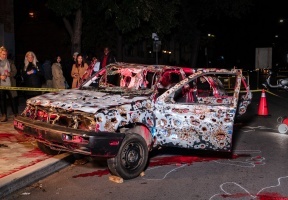 The artist felt it was important to bring Shot Up Car to the Chicago area after being concerned about the sharp rise in gun-related homicides in the city over summer/fall 2018. Mitic is a noted artist whose works have garnered significant national media attention. The Shot Up Car rolling exhibit is scheduled to stop in and around the following locations in the Chicago metropolitan area from November 15 to November 17: Cloud Gate, City Hall, Millennium Park, Lincoln Park, Wicker Park, The United Center and other key venues.